Fact: I had never made biscotti until now. 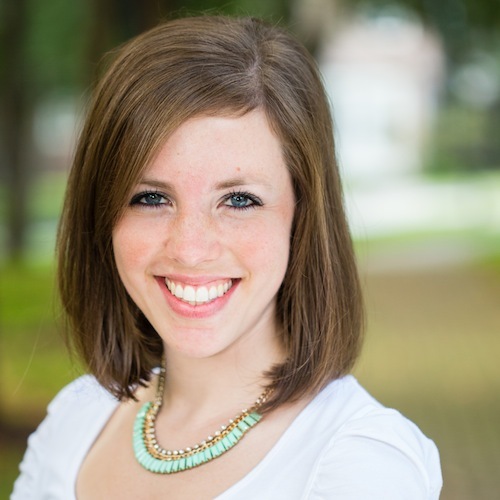 I was super nervous and I was afraid of it. It’s kind of like how nervous you get before making risotto. It just seems way to complicated a task, until you start making it and you’re like, ‘Oh, wow…this is a whole lot easier than I thought!’. It took two attempts to make this recipe. The first one, I put the dough into one large log on the baking sheet. It literally flatten out like a giant cookie….which is not a bad thing…just not what you want for a biscotti. The second round, I split them into two logs on either size of the baking sheet and they turned out great. Normal length biscotti. Yay! After making two other biscotti recipes that same day, this was probably my least favorite recipe, just due to the fickleness of the dough spreading out so badly on the baking sheet. The other recipe’s logs tended to keep their shape, allowing for thick biscotti. Mmm! I can’t wait to show you the other two recipes this week! Be on the look out!!! In a large bowl, combine the flour, brown sugar, baking powder, baking soda, ginger cinnamon, nutmeg, cloves, pecans, and raisins. Stir. In another bowl, stir the molasses, eggs and orange zest until well blended. Add the wet ingredients into the dry ingredients and stir until the dough comes together (it will be sticky). Turn the dough out onto a lightly floured surface and gently kneed the dough a couple of times until it comes together. Separate the dough into two logs. Place the logs onto a baking sheet that has been covered with either parchment paper or a silpat mat. Flatten the logs with the palm of your hand. Bake on the middle rack for about 35 minutes, or until lightly browned and risen. Allow the logs to cool enough to handle. 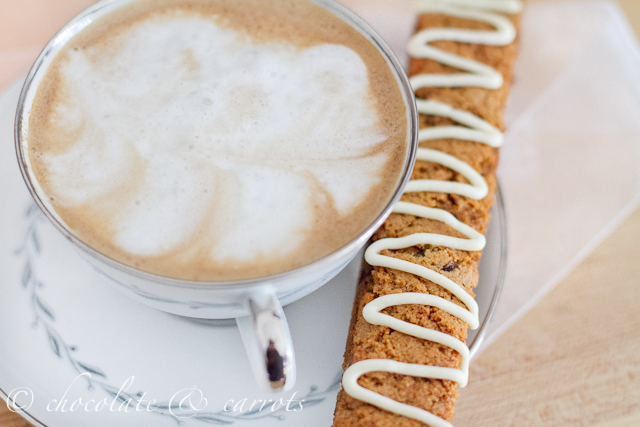 On a cutting board with a serrated knife, cut the biscotti at an angle into about 3/4″ pieces. 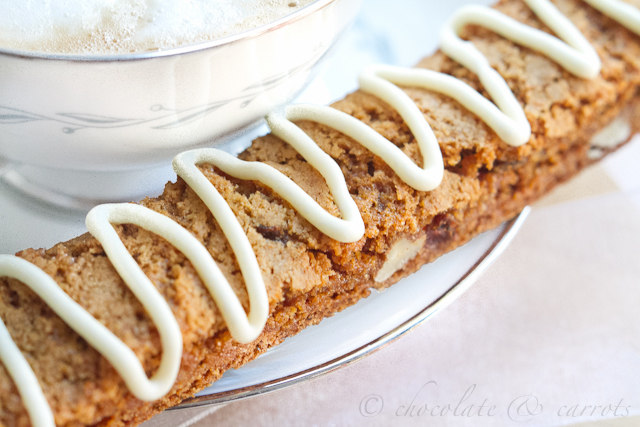 Lay the biscotti on their side back on the baking sheet in an even layer. Bake for another 10 minutes or until dry. 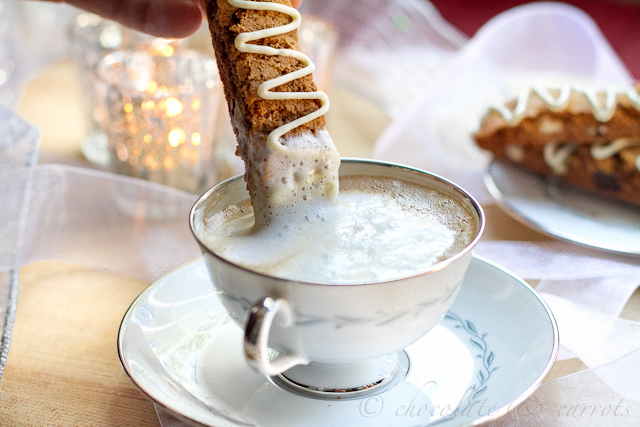 Allow the biscotti to cool completely. Over a double boiler, melt the chocolate. Dip the either one end of the biscotti or an entire side into the melted chocolate. Place on a piece of parchment paper or silpat mat to harden. Once completely cooled and hardened, store in an airtight container for up to 2 weeks. Mmm, I can smell the holiday spiciness of these from here! (Or at least I’m pretending I can. 😉 ) They definitely look super festive! oh my, these look so good! Almost too pretty to dip and eat! Love, love these flavors. I posted gingerbread donuts today. Spices of the season! Oh and I love how sunny your pictures are. Nice! Is that a Christmas Tree I see in that drink?? Can’t wait for your other recipes. 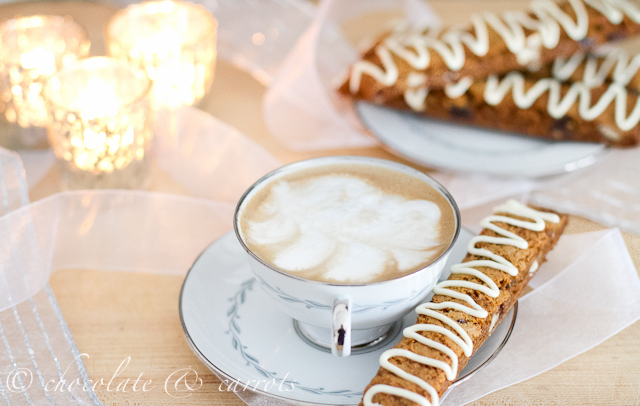 I have yet to make biscotti too! I wish I had one for my tea right now! 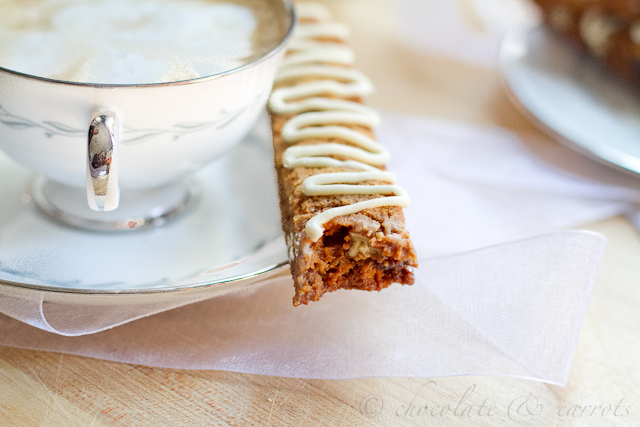 They look like biscotti sticks! Perfect for dipping in my cup of tea or hot chocolate. 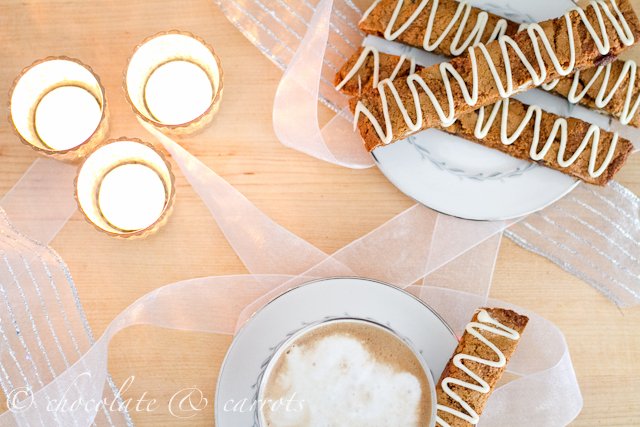 I can’t get enough of gingerbread-inspired holiday treats, and these biscotti look fantastic! I love that you used olive oil instead of butter, and the white chocolate drizzle is the perfect finishing touch.